In the 1990s in Kashmir, one could meet a militant (back then we didn’t call them terrorists) as easily as perhaps one’s neighbour. Hordes of them were returning from Pakistan, where they had gone to learn how to use a Kalashnikov and lob a grenade, many of them carrying the gun and the ammo in their backpacks. Women sang songs to welcome their ‘ghazis’ (warriors), not understanding the scope of their adventure. Many of these militants were arrested by the army and the BSF, while others surrendered. “Why did you go to Pakistan?” was the obvious question they’d be asked. The reply, invariably, would be: “Election mein dhandhli hua tha na? (The elections were manipulated, weren’t they? )” The reference was to the 1987 assembly elections, which, in public perception, were massively rigged by the National Conference regime of Farooq Abdullah to check the rise of the Muslim United Front (MUF). MUF, a precursor to the Hurriyat Conference, was cobbled together to challenge the hegemony of the National Conference, while the Hurriyat, on the other hand, was made to order from Islamabad as a political face of anti-India armed campaign. I once met a 14-year-old Pakistan-returned boy in the custody of BSF inside a camp which was designated as a police chowki. This was in the mid-1990s. He too told me the “election mein dhandhli” story; it struck me that he must have been barely six in 1987. After I got into a long conversation with him, he admitted to me that instructors at the PoK camp where he was trained had told him to speak thus if he was caught. This generation of Kashmiris was fed such anti-India stories to ignite the fire in their bellies, while on the ground the gun culture was resulting in the mushrooming of tombstones in the Valley’s graveyards. The reality is that, in those days, elections in Kashmir were as much rigged as they were in, say, Bihar or Uttar Pradesh. The ostensible dispute as regards the 1987 elections was limited to five to six constituencies; the MUF had won just four seats in the elections. With the benefit of hindsight, one can say today that the MUF was a premature idea and therefore didn’t trigger as much euphoria as its leaders had expected. Years later, the PDP, with its politics of soft-Muslim identity, did become a reality. However, the MUF and the 1987 polls created militant leaders like Yasin Malik and gave rise to the most violent phase in Kashmir’s history. Soon leaders were taking leave of Kashmir because militants started killing them; the army, BSF, CRPF and ITBP filled the streets and villages of Kashmir. The men in olive greens were now the face of India for a generation of men and women in their teens. Initially, the forces were welcome, as their presence in mud bunkers in the middle of downtown roads and roundabouts had ended the reign of terror unleashed by local militant commanders. Gradually, as militancy became a more deadly game, with Pakistan sending in mercenaries and sophisticated arms, the forces had to change tactics and use harsh methods to deal with those who were even remotely suspected of helping terrorists; many innocents faced the ire of the forces. Now, the new face of India was cruel for most youngsters. No army in the world has peaceful answers to eliminating terrorists hiding in built-up areas, as they did in Kashmir. Many lost lives and properties in encounters and as collateral damage. By now, the radicals were calling shots in the Islamic word; fundamentalists were asserting themselves and creating global communities of persecuted Muslims. Kashmir was one important dot in this global network. Leaders like Syed Ali Shah Geelani, who had lived all their life on the privileges of the Indian system, were now espousing the cause of ‘poor’ Kashmiri Muslims. The ailing octogenarian was single-handedly behind the conversion of hundreds of Kashmiri youth into hardliners and India-haters before he was put under house arrest. 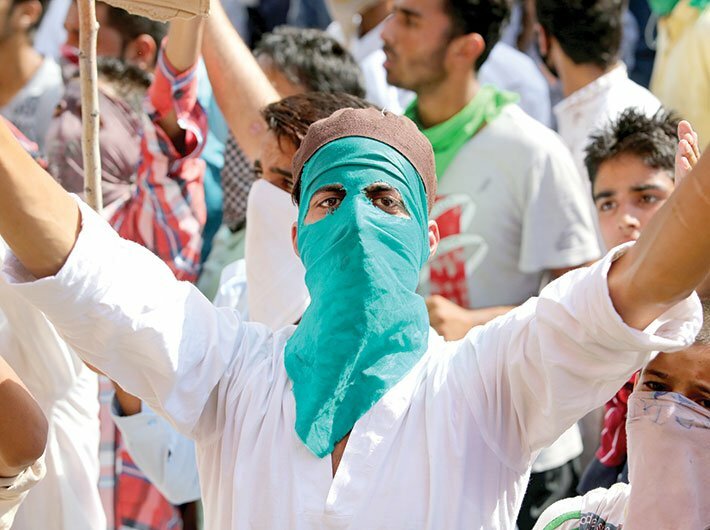 Supporters of Kashmir’s ‘azadi’ could now clearly see the armed struggle as a fight between Islam and a secular or ‘Hindu’ India. Geelani had fired their imagination, espousing Islam against secularism. A new generation of Kashmiri youth now openly spoke of and flaunted their Islamic identity, with women taking to the veil and men to Arab black-and-white checkered guthra (headscarves) and keeping long beards. Those years saw a massive destruction of Kashmir infrastructure by militants – schools, post offices, bridges, transmission towers. Cable TV, liquor and cinema were banned. The Kashmiri youth was further pushed deep into a cocoon. Now, the leaders were back from the hot plains of Jammu and Delhi; they lived in bungalows which looked like fortresses and moved in bullet-proof Gypsy vans which were escorted by four to eight vehicles carrying crack shooters. The youth turned to them for jobs and had to stand in long queues and undergo multiple security checks before being allowed in. Jobs were scarce as the industry saw no possibility of setting up units in the Valley. Lakhs thronged an occasional recruitment rally of police or army and those selected were looked at with envy. Gradually the dominating narrative in Kashmir was the one dictated by Islamists and pro-Pakistanis. Nobody batted for India, nobody spoke for it. All the mainstream parties – the National Conference, the Congress and the CPI(M) – had leaders who invariably took a soft approach while speaking against anti-Indians. They helped keep the narrative of plebiscite, self-determination, autonomy and self-rule alive, much to the comfort of those holding the apron strings of militancy while sitting in Rawalpindi. Nobody said, for example, that accession of J&K to Indian domain was final and people are not supposed to change their national allegiance at the drop of the hat. None told the Kashmiris about the plight of linguistic minorities in Pakistan and the failure of that country as a state. Mainstream leaders seemed just like the softer voices of separatists. Then comes the BJP with its ultra-nationalist aura and shakes hands with the green flag of PDP to confuse Kashmiris once again. The two parties cobbling together a government as part of emerging coalition politics is technically fine, but for an average Kashmiri, it was the coming together of the two opposite poles. How could two extremes of a religious divide join hands? For the youth, it was betrayal by the PDP. It gave rise to the Burhan Wanis and a generation of stone-throwing Kashmiris for the Indian security forces to deal with. The mess was inevitable. Now, the Narendra Modi regime has embarked on a hard policy on Kashmir – on the one side, it’s ignoring Pakistan, the real troublemaker in Kashmir, and taking it on militarily on the Line of Control. Within Kashmir, the army has been given the go-ahead to deal with troublemakers as it deems fit. No doubt, after a Major paraded an alleged stone-thrower tied to the bonnet of his jeep to rescue polling staff in it, the stone throwers have retreated. But the question is: Has their anger subsided or they have just made a hasty retreat out of fear which is temporary?